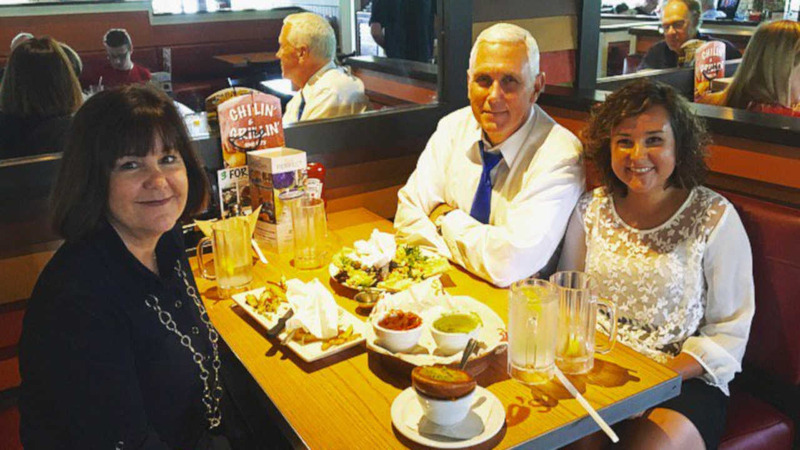 NEW YORK (WABC) -- Donald Trump's running mate, Indiana Governor Mike Pence created some strong reactions on social media after he tweeted a picture with his family sitting down at a meal at a local Chili's before heading back home. Shortly after Pence's tweet was posted, he got numerous replies questioning his choice of restaurants while in the area - some even questioning why he couldn't get a seat at Trump Grill. @mike_pence you came all the way to NYC and you are eating @Chilis ? You realize NYC has hundreds of GOOD restaurants, right? @mike_pence It's New York City. Why would you not eat at a local restaurant? Not even a fancy restaurant—even a pizzeria or coffee shop. @mike_pence You're in NYC and you went to Chili's? Are you kidding me? Support local small business dude. According to Chili's website, the only restaurant locations in New York City are Richmond Avenue on Staten Island and on Cooper Avenue in Glendale, Queens. One tweet suggests that Pence ate at the East Rutherford location. Eyewitness News reached out to the East Rutherford Chili's location, but would not confirm whether Pence was there Saturday.